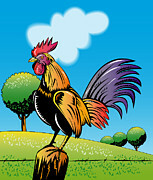 Most people think the answer to the question “why do roosters crow?” is that they crow to announce the dawn. But farmers and people who live in the vicinity of a farm know that roosters also crow during the day, so announcing the dawn may not be the only reason. Some think roosters crow to announce impending danger to their hens, or in response to some far away sound; like the sound of a tractor or the moo of a cow and more.. I suffer from recurring severe migraine headaches. These episodes, occur about once a month and I have learned to live with them. I am not sure what triggers them. I suspect they are related to weather changes. In winter a cold front approaching can trigger the onset of migraine and when the front has passed the migraine just goes away. I know how to manage and reduce the intensity of the pain using different techniques. Sometimes deep breathing and relaxation works. Other time I talk to the migraine and ask it to please leave. Although it does not leave, the pain seems to subside somewhat. The most recent migraine episode was really intense. I felt that little sensation over my left eye that announces the onset just before bedtime. I knew it was going to be a long night, so I started with my deep breathing, relaxation and meditation. After a while I was able to drift to sleep. I woke up sometime during the night, in agony. The pain was so intense it was unbearable, and unmanageable. Nothing I did seemed to tone it down; just the opposite every move I made seemed to intensify it. It hurt so much I felt I could not endure for the duration. I wanted it to go away. Stop. I wanted to be out of my body. I was now in a very unstable state on mind; on the edge. It’s a scary place. I panicked. I realized I should not be alone right then and there and I reached for my cell phone to call my neighbor although it was still dark outside. Before I could dial, his rooster crowed. The sound felt so real and so close as though he was right there in the room with me it had a sobering and grounding effect. It brought me back from the edge. My state of panicked disappears. I looked at my cell phone time and it was 3:00 AM. So for me, the answer to the question “why do roosters crow?” is a profound one. Roosters crow to lead lost and frightened souls back to a place of safety. My neighbors rooster saved my life that night. His song was like a beacon that led me back from a very scary place; the edge of the abyss.